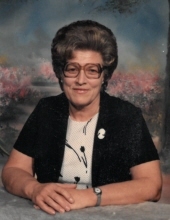 Mary Rose (Havens) Luckey, daughter of the late Marian Everet and Mary Florence (Emery) Havens, was born June 19, 1933, in Douglas County, Missouri, and passed away April 6, 2019, at Mercy Hospital in Springfield, Missouri. She was 85 years, 9 months, and 18 days of age. Mary grew up in the Vanzant, Missouri area. She attended and graduated from Dora High School. She married Lawrence Allen Luckey on May 18, 1954, in Tunica, Mississippi. Four children were born to this union. Mary was a hard worker and retired from Autumn Oaks Caring Center in Mountain Grove, Missouri, as a Certified Medical Technician. Mary loved being outdoors, making garden and growing flowers. She loved to crochet and loved spending time with her grandchildren. Mary was very outgoing and loved to socialize. She loved to sing at church as long as her health permitted. Besides her parents, Mary was preceded in death by her husband, Lawrence Luckey, one daughter, Connie Fellers, one brother, Lyle Havens, two sisters, Maydean Sparks and June Wake, one grandson, Brandon Luckey, one granddaughter, Cindy Renee Porter, and one son-in-law, Lonnie Rogers. She is survived by one son, Gary Ray Luckey and his wife, Verna, of Elkland, Missouri, two daughters, Bonnie Rogers and Terenna McLean and her husband, John, all of Mountain Grove, one son-in-law, John Fellers, one sister, Corrine Rodgers of Vanzant, eight grandchildren, numerous great, great-great, and great-great-great grandchildren, and a host of other relatives and friends who will miss her very much. To send flowers or a remembrance gift to the family of Mary Rose Luckey, please visit our Tribute Store. "Email Address" would like to share the life celebration of Mary Rose Luckey. Click on the "link" to go to share a favorite memory or leave a condolence message for the family.